How do I use Punch Limiting without scheduling? If you don't have the scheduling feature, you can still take advantage of Punch Limiting. 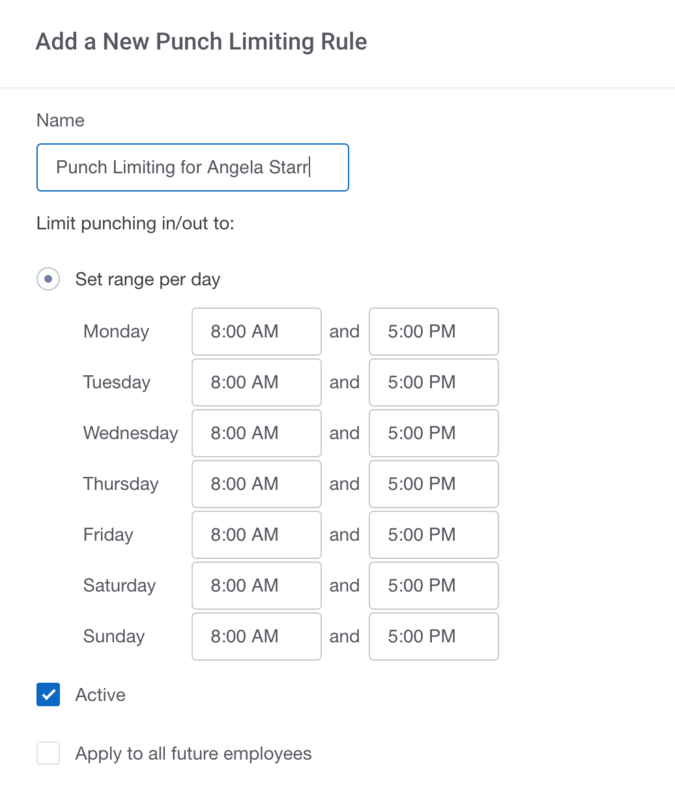 If you don't have the scheduling feature, you can still setup Punch Limiting for your employees. To set this feature up, you'll want to start by visiting Settings --> Punch Limiting and select +Add a New Punch Limiting Rule. You can create as many rules as you'd like, but employees can only be assigned one rule at a time. Setting up the rule itself is quite simple. First enter a rule name, then specify the timeframe an employee is allowed to punch in or out. If you'd like to restrict an employee from punching any time on a particular day simply enter the same start and end time. Once you've set the range per day check the Active box, assigned the appropriate employees, and click Save.